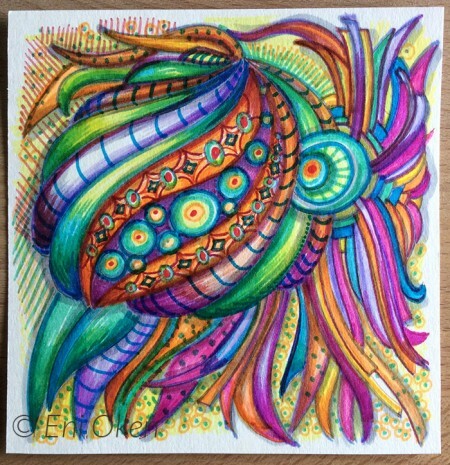 Continuing my explorations in the wonderful world of color through markers, this ZIA (Zentangle® Inspired Art) includes tangles Aruka, Abundies and Arckles. I'm very happy with the results! This is the original artwork, created using Micron Sakura Pen. Here it shows how I started to use colored Sharpie pens to improve the outline. This is the first pass with markers. I used colorful Sharpies too, to enhance the outlines. I wish I had remembered to take a photo halfway through this process, but I was really focused on the piece! Although there is very little difference between this one and the previous one, a lot of work was done with colored pencils, bringing out some brilliance and smoothing the highlights. Here's the final image! The highlights were improved, the darks enhanced and white gel pencil added for the final touches. I love it! The tile measures 5x5 inches.